Though we only have a few more performances of Turandot, another great show is about to open: a group of teens participating in a Seattle Opera & Seattle Public Theatre camp open their production of Sweeney Todd this Friday at the Bath House on Green Lake! These young performers have been rehearsing daily over the past few weeks, working under the stage direction of Kelly Kitchens (from Seattle Public Theatre) and the music direction of Barbara Lynne Jamison, Seattle Opera's Youth Programs Manager. And it’s not just the performers on stage who have benefited from the experience. There is also a stage management team comprised of high school students. Sweeney Todd’s costumes are designed by high school senior Amy MacDonald. 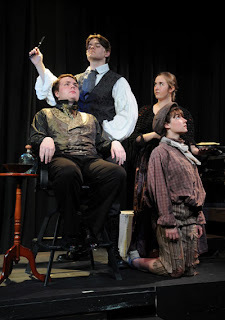 All that talent and hard work will be on display for a string of performances that begin this Friday, August 17, at 7 p.m. Other performances will be held on August 18, 24 & 25 at 7 p.m., and August 19, and 25 at 2 p.m. All performances are FREE and open to the public. We’d love to see you there! For more information, visit http://www.seattlepublictheater.org/education-performance.htm. 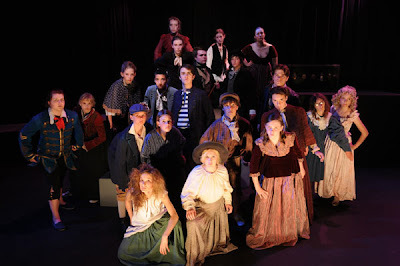 The cast of Sweeney Todd. To learn how your child can take part in one of Seattle Opera's many Education opportunities, visit http://www.seattleopera.org/discover/learn/children/programs_for_children.aspx.